As the first comprehensive, empirically tested intervention specifically designed for toddlers and preschoolers with autism, the Early Start Denver Model (ESDM) is an early intervention approach for toddlers ages 12-36 months and continuing until ages 48-60 months. The model does not require a particular setting for implementation and can be used by parents, teachers, therapists, at home, in preschool or in a clinical setting. 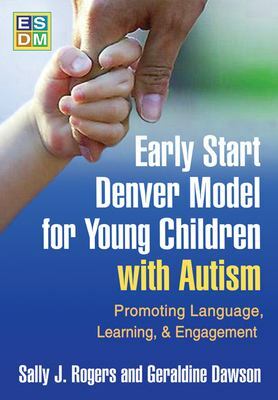 To help you get started with this early intervention model developed by Sally Rogers, Ph.D., and Geraldine Dawson, Ph.D., we are offering a 15% discount on the Early Start Denver Model for Young Children with Autism Manual and its accompanying Curriculum Checklists this week. Just enter in the promotional code BLOGESDM3 at check out to redeem your savings! The manual provides structured, hands-on strategies for working with very young children in individual as well as group settings to promote development in key areas such as imitation; communication; social, cognitive and motor skills; adaptive behavior; and play. 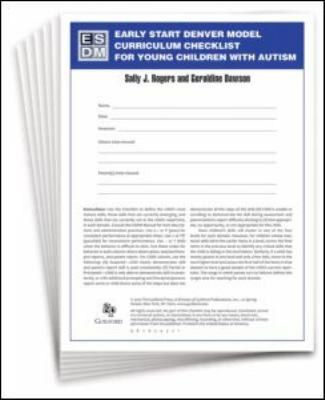 In order to implement individualized treatment plans for each child, users must complete the ESDM Curriculum Checklist, which is an assessment tool. One non-reproducible checklist is included in the manual for reference with instructions for use. Additional checklists are sold separately in sets of 15. *This offer expires on October 8, 2013 at 11:59 pm EST. Not compatible with any other offer. Be sure there are no spaces in the promo code at check out! Written by: Different Roads to Learning on October 1, 2013.on September 30, 2013. This entry was posted in ABA, autism, autistic spectrum disorder, Behavior, Daily Living Skills, Development, Difflearn Promo Code, From the Experts, Pick of the Week, Products, Research, Resources, Sale, Social Skills, Speech & Language by Different Roads to Learning. Bookmark the permalink.